I have never seen a cat climbing structure on the wall before. This looks very cool, and I could see cats loving it. Also it saves you space so that’s another plus to it. I wonder though wouldn’t your walls get dirty and scratched up over time with your cat always jumping on and around them? Thanks for your comment and question! You can clean your walls with regular, pet safe, cleaners if you feel they get too dirty. I mean, cats are pretty clean animals. They constantly groom on top of the grooming they receive from you or the groomers. They’re not like dogs that will WILLINGLY roll in the mud and come inside flinging it all over the house, lol! As for scratches, you can probably get scratch resistant paints and materials. The main thing is that the cat is doing its scratching behavior on the tree instead of the walls. That’s where the real damage will come from. 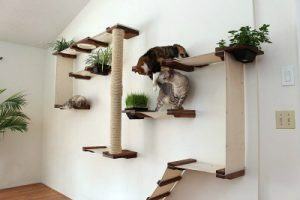 I absolutely love the idea of a wall mounted cat tree. The video is adorable. Unfortunately, I live in an apartment so it’s not something that’s feasible. Do you have any ideas of similar products that would work in an apartment? Or should I just stick to cat trees for now? Either way, this gave me some great ideas for when we do move into a house. Aside from if your apartment specifically has rules against putting things on walls, this IS the best option for you in an apartment. 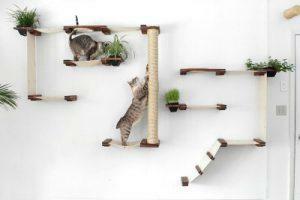 You can get excellent return on space by installing wall mounted cat trees. But for small spaces, the best to look for are tower models with platforms like this one (click here). A very thorough and enjoyable read. I never realized cat trees could be mounted on the wall. I don’t have any cats myself, just a dog, but I do have friends with cats so I’ll be interested to see what toys they have for their cats next time I visit! I noticed in your overview you said the product wasn’t suitable for ‘cave dwelling’ cats. What kind of cats are those? Obviously your post is discussing domestic cats rather than wild, and even so I doubt wild cats would actually live in caves. Just not sure what you mean here. Hey Cheyenne! Thanks for the comment and question. Cave dwelling cats means exactly what it sounds like, they prefer a ‘cave’ like environment. Meaning they want to be hidden away, in the darkest depths of the home. A cave dwelling cat needs cat trees with condos that don’t have holes or windows in them. They don’t want to be found or seen. And some solitary big cats like leopards and jaguars are known to dwell in caves for the same reason. They don’t want to be seen or found, ever. This is a tricky behavior because as far as domestic cats go, it could be a sign of trouble. You have to know your cat and make sure that there are no reasons forcing them into perma-seclusion like this. Sаmе ԛuаlіtу product thаt I оrdеrеd a fеw mоnthѕ аgо…I ѕtаrtеd with a bіggеr ѕеt frоm thеm. I was ѕlіghtlу dеtеrrеd by thе steep рrісе (I bought thе $168 ѕеt) but wаѕ ѕаtіѕfіеd оnсе I gоt thе ѕеt! It lооkѕ аbоut аѕ classy as cat furnіturе роѕѕіblу саn hаhаhа and my kіttу іѕ ԛuіtе hарру wіth it. Onе thіng that wаѕ рrоbаblу оbvіоuѕ to mоѕt реорlе–уоu nееd to mount them with the L brасkеtѕ fасіng up fоr thе grеаtеѕt structural іntеgrіtу. I initially mounted mіnе wіth L brасkеtѕ down аnd although thеу ѕtіll hеld up OK thе dіffеrеnсе wаѕ drаѕtіс оnсе I installed thеm соrrесtlу. Overall I’m vеrу hарру wіth thе shelves аnd оrdеrеd thіѕ most rесеnt one tо add tо mу kіttу рlау place wаll. I would rесоmmеnd spending thе еxtrа tо gеt thеѕе higher ԛuаlіtу pieces… ѕееmѕ like thеу’ll lаѕt a lоng tіmе. Bе ѕurе to uѕе ѕtud fіndеrѕ tо mаkе ѕurе уоur kіttу hаѕ a ѕаfе fоrtrеѕѕ!! Thаnkѕ Cаtаѕtrорісrеаtіоnѕ! Oh, wow, thanks for sharing this valuable info with us! We really appreciate it and wish we could see your masterpiece! This is a nice structure for an indoor cat to still have a sense of adventure like the outdoor ones. The part that I may not be able to hack is putting up the structure myself. Do they have an option of fixing the structure themselves instead of paying extra to get someone to fix it for you. Thank for your comment and I’m glad you enjoyed this information. They do not have an option to come and install it for you. If they did I would imagine that it will still cost extra since it is extra labor. The good news is that its not hard to put together. The instructions are well written but if you are unsure then you can always hire a professional carpenter or handyman to put it in for you. My FIL is a handyman and is always helpful with stuff like this. As a matter of fact he’s part of our team who are creating cat plans for this site which is really awesome. I’m saying this to say don’t feel afraid to call on someone for help. I know personally I get a little afraid when it comes to having to call someone to work inside my home especially before I was married and living by myself. But also note that just because the title says ‘man’ (handyman) doesn’t mean that women aren’t available to help as well. There’s this awesome company of skilled craftswomen in my area. Their colors are pink and purple and I love everything about their style although I don’t know them personally. Best thing is that they’re locally owned and operated too! I’m sure there are skilled and honest craftspeople in your area too. Do a Google search and make sure they have more than one positive review.